Allen Doane is one of Hawaii’s top-ranking corporate executives. Allen has worked in various companies prior to his current tenure as chairman and chief executive officer of Alexander & Baldwin, Inc., one of the oldest and largest corporations and the only surviving Big Five company in the state. He holds an extensive academic qualification from some of the country’s prestigious universities. Through Allen’s leadership, Alexander & Baldwin has given more than four million dollars to charities in Hawaii and the Pacific in the last two years. 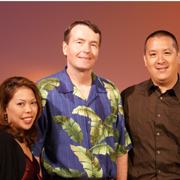 Allen is a director of First Hawaiian Bank and Pacific Guardian Life Insurance Company. He also serves on the boards of a number of community organizations. Allen likens his job as CEO to a compass, setting the direction of the whole organization. But being the top honcho of the company, he still leaves many of the corporate decisions to the hands of the board of directors, effectuating a democratic approach to corporate management. To Allen, it is a strong family background and the natural curiosity to accomplish things that he attributes to a successful career in the corporate world. According to Allen, he never displayed extraordinary talents nor performed well academically during his formative years. Greater Good Television brings Allen Doane, chairman and CEO of Alexander & Baldwin, and director of First Hawaiian Bank and Pacific Guardian Life Insurance Company. Listen now to this interview find out more about the man behind one of Hawaii’s most successful companies. Allen Doane is Chairman and Chief Executive Officer of Alexander & Baldwin, Inc. (A&B). He joined A&B in 1991, was named Chief Executive Officer in 1998, and Chairman in 2006. Prior to joining A&B, Doane was Chief Operating Officer of the Shidler Group from 1988 to 1990. Prior to that, he was Group Vice President of IU International Corporation, a large diversified company headquartered in Philadelphia. He began his business career in 1975 with C. Brewer in Hawaii. Doane is a director of First Hawaiian Bank and Pacific Guardian Life Insurance Company. He also serves on the boards of a number of community organizations. Doane is past Chairman of the Chamber of Commerce of Hawaii. Doane is a graduate of Brigham Young University and holds a Master’s Degree in Business Administration from Harvard Business School. He served as an officer in the U.S. Navy for four years. A&B is one of Hawaii’s oldest and most successful companies. The Company had revenue of $1.6 billion in 2006 and has 2200 employees. A&B is publicly traded with a market capitalization in excess of $2 billion. Principal operating units of the Company are A&B Properties, Matson Navigation Company, Matson Integrated Logistics and Hawaiian Commercial & Sugar.